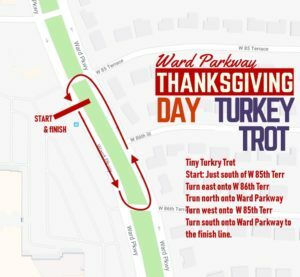 Don your turkey hat, pose for pics and earn your pumpkin pie after running along beautiful Ward Parkway! 10K Start: 8:35AM | 85 St. and Ward Parkway- east side of the Ward Parkway Center. 5K Start: 9:00AM | 85 St. and Ward Parkway- east side of the Ward Parkway Center. A Kids Fun Run for ages 12 & under. This run is not timed, is approximately 200 yards long and will start at 10:15AM (or after the last 5K participant crosses the finish line). *Pie, medal and goodie bag are given at the Tiny Trot finish line. *Save time with our Concierge Packet Pick-up. Email info@resultskc.com with each runner’s name, we’ll pull your bibs and shirts, so you don’t have to wait in line at packet pick-up! See the course map along scenic Ward Parkway! For all information in one place, read our Participant Guide! Thursday Nov 28th (race morning) from 7:30-8:55 AM inside a retail space on east side of the mall, between Trader Joe’s and Maurice’s. *Request to have us pull your group’s bib numbers and shirts for faster pick-up! Please email info@resultskc.com with your name and group info prior to Wednesday November 27th. Look for the pace signs at the starting line and line up according to the pace you’ll run. When you register, you will choose one of 3 categories; Elite Runner (8 min pace or faster), Runner (above 8 min pace) or Walker/Non-Competitive. Elite runners will go out first, then runners over 8 min pace and then walkers and strollers. Have updates sent immediately to your phone (and to your family’s phones). Click the “Manage Updates” link at the bottom of your registration confirmation email. There will be a “Results” tent at the finish line festival. 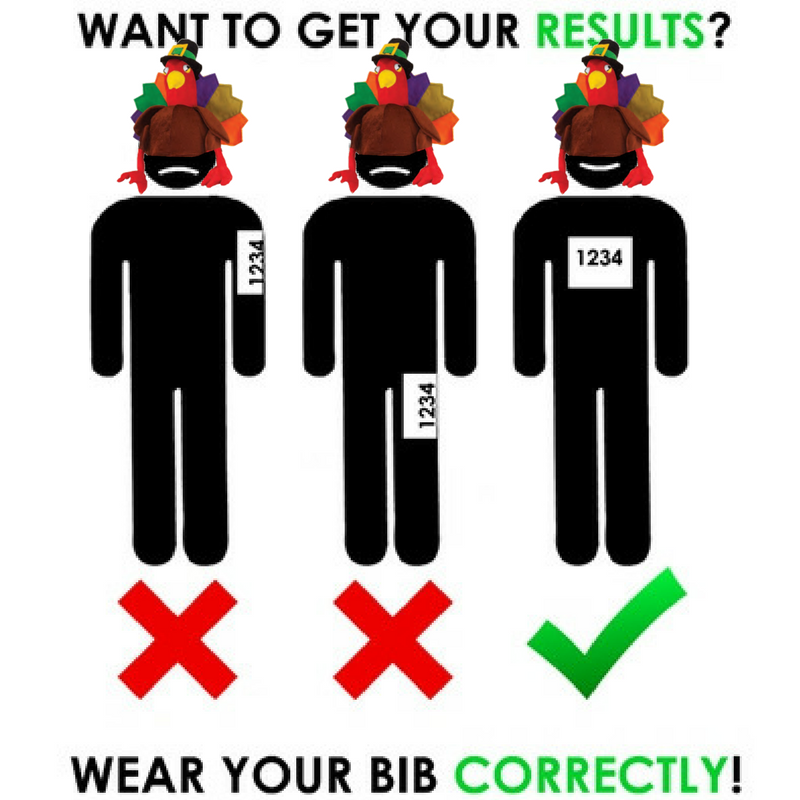 Be sure to attach your bib correctly. Parking Map The best place to park is on the west side of State Line Road, in the Ward Parkway overflow parking lot. You won’t be able to drive through the tunnel for the safety of all the runners walking to the start line. You may also park in the mall parking garage, on the east side of the mall. Please enter the garage from 89th St & State Line, Ward Parkway will be blocked for the race. There will be parking attendants to help you find a space without searching the area! – Thanksgiving Themed medal will be given to top male and female finishers and top 3 finishers in age groups: 9 & under, 10-14, 15-19, 20-24, 25-29, 30-34, 35-39, 40-44, 45-49, 50-54, 55-59, 60-64, 65-69, 70-74, 75-79, 80+. 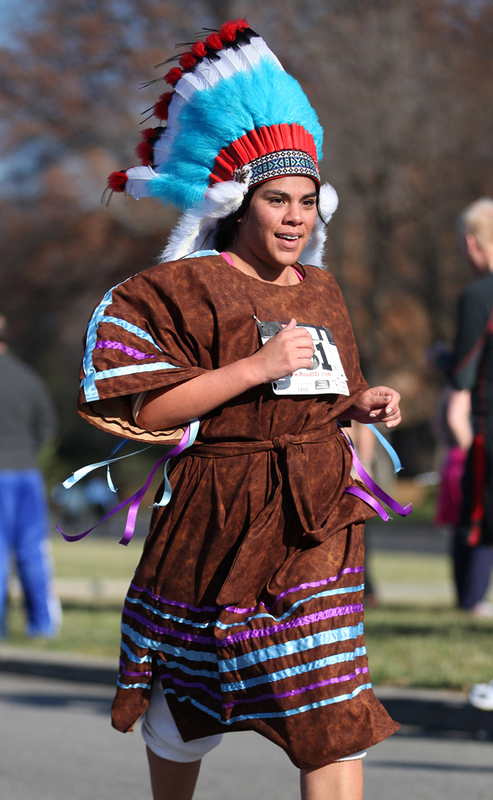 – Awards given for Best Thanksgiving Themed Costume and top 3 fastest family teams! 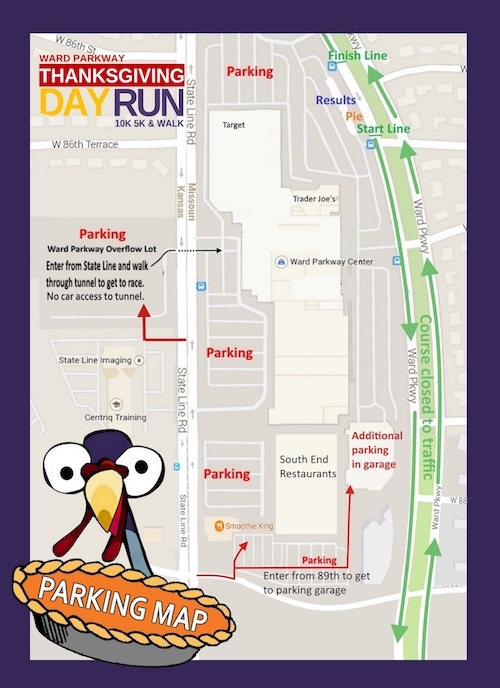 Look for the photo op area where you will find a backdrop, inflatables and Turkeys, (not the real ones, but some friendly runners in costumes! Post your photos on social media with the hash tag #KCPieRun. Pictures from the event will be posted here 24 hours after the race! Walkers with strollers are welcome in the 5K and will start behind the runners so everyone will be safe! The Single MOM KC and Harvesters Community Food Network. Please visit our Charity Partners page for more information. No refunds will be given for the event but you can choose to switch to the virtual race option if your plans change for Thanksgiving. Anyone switching to the virtual option should email us at info@resultskc.com. E-mail us at info@resultskc.com or contact us on our Facebook page. Note: No motorized vehicles, roller blades, bikes or dogs will be allowed on the course as our insurance policy does not cover these. Protection will be provided at all intersections by volunteers or the Kansas City Police Department.